The Amazon is my home! 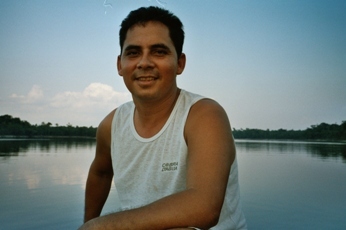 I grew up in the South of the Amazon in the jungle along the riverside, a real caboclo. That's how they call the people from this state of Brazil. My parents taught me all about the forest. How to survive there and what you can use from the forest (fruits, medical plants etc.) As a little boy I went along with my father to the forest to collect rose wood and Brazilian nuts, which we sold. When I got to the age to go to school I had to paddle a lot. We went to school by canoe and had to paddle for a few hours. The teacher, a lady who gave lessons in her house, was also the midwife in town. So if she had to help somebody with delivering a baby, there was no school and I would paddle back home again. In order for us to get food we had to go fishing. Children have to help fishing as soon as they're able to do this. I know how to get different kinds of fish and of course how to prepare them. I also had to learn all the eatable things the forest has to offer. I started working in tourism when I was still very young. First I worked for a lodge, starting in the kitchen doing the dishes. This gives me an opportunity to learn cooking from the professional cooks of the lodge. After a few years working in the kitchen, I moved to the bar. Here I learned how to prepare different drinks, and worked as a barman. Later they let me help the tour guides as an assistant tour guide. In the mean time I learned English from the tourists. Since 1994 I worked for several lodges as a tour guide, in 2000 I started selling the tours as well.